PB&J for breakfast? Yes, please! This peanut butter and jelly waffle sandwich is a little more grown-up than the childhood classic, but it's just as satisfying! Adding in fresh fruit makes it feel a little more adult and it cuts down on the sugar that is in the jelly! I used frozen whole grain blueberry waffles for this dish. They make this breakfast super easy and much faster than making the waffles from scratch! Of course, you could use homemade waffles, too! I sometimes make a bunch of waffles in a large batch and then freeze them for reheating throughout the week! Love me some waffles! I also like using whole grain or protein waffles to add in some nutrition. This is a great way to get picky eaters to eat whole grains! I had beautiful fresh blueberries on hand, but strawberries, raspberries, or grapes could be substituted! You could also use a different kind of nut butter, such as almond or cashew! 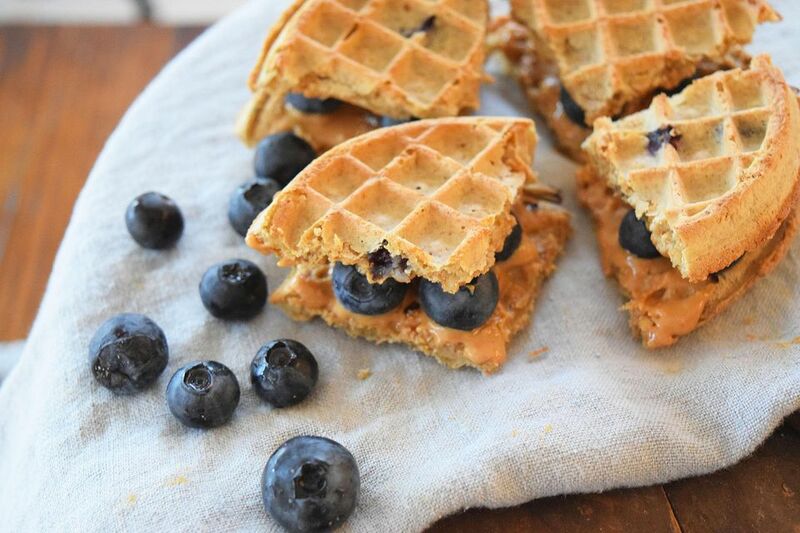 Wrap these waffles to go in some parchment paper and you have a easy breakfast on the run!